My uncle was the first chiropractor in our family. I knew early on that I wanted to be in the medical field but wasn’t sure which direction to take. I went to medical school for a short time after serving in Vietnam. The philosophy of chiropractic made a lot of sense to me. Since the brain controls the body, the healing process starts from within not the outside. I decided to become a chiropractor. 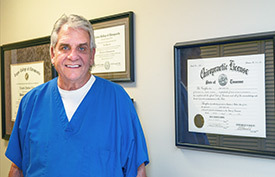 Dr. Larry chose to attend Palmer College of Chiropractic in Davenport, Iowa and graduated in 1973. There’s an old saying that Palmer is to chiropractic as Harvard is to medicine. Dr. Larry chose to go to school where chiropractic began. The courses Dr. Larry took included the Gonstead and Diversified techniques. He uses these methods in the full spine work Back and Neck Specialists still offers today. After over 40 years in practice, Dr. Larry has seen countless people get well by realigning the spine so the body can heal. Dr. Larry is also a member of the Spine Research Institute of San Diego. This organization helps to inform people about what happens in auto accidents and trauma, including low-speed injuries and contact sports. Dr. Larry started a radio show in the early 90’s called Back Talk. The purpose of the radio show was to educate the community on the benefits of chiropractic care and overall natural health. Back Talk was the #1 weekend talk show in Memphis for several years. One of the biggest highlights of Dr. Larry’s career is his invention of the Side Sleeper Pro Air pillow. He realized years ago the benefits of sleeping on your side and saw the need for a pillow to support proper sleeping position. These pillows are now available in 35 countries around the world. Dr. Larry holds four patents on the pillow. Dr. Larry is married to his wonderful wife, Lynda. They have five children and five grandchildren. Their hobbies include traveling, boating, fishing, golfing and living life to the fullest with each other. They are members and supporters of a local church and hold membership in The Exchange Club of America. We see miracles happen every day from chiropractic care. Contact our office today to find out how we can help you!